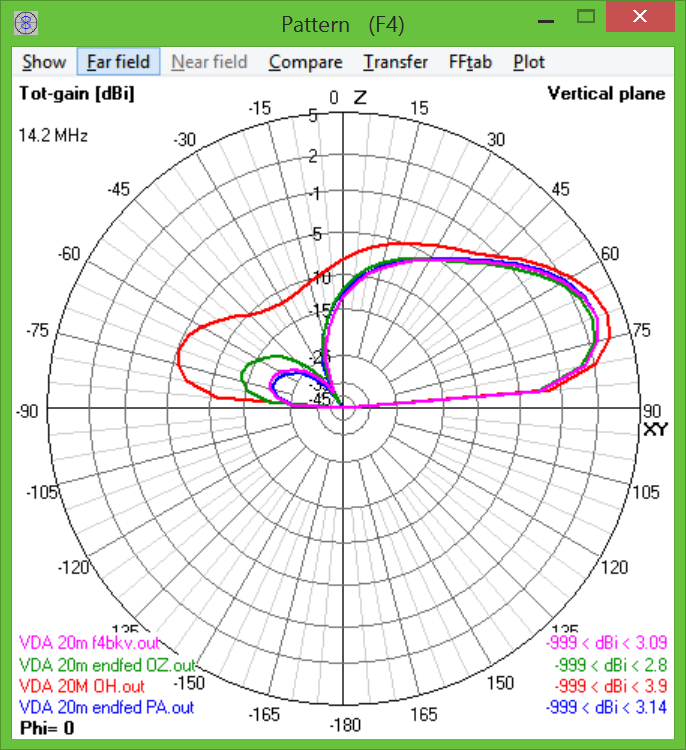 Always looking for more effective antennas for working DX while /P, I have been investigating the two element VDA (vertical directional array). On the web there are some different stories about this antenna. Everyone seems to agree that this antenna is a great antenna for the expedition to a coastline where the antenna can be put very near to salt water. As with all antennas, the salt water with its high conductivity improves the antenna radiation as the ground losses decrease. Only so much of our world is coastline, so what happens when you use the VDA over "normal ground"? Some say it becomes useless. This is however only in comparison to the performance over salt water. In this comparison a lot of antennas are useless over normal ground. 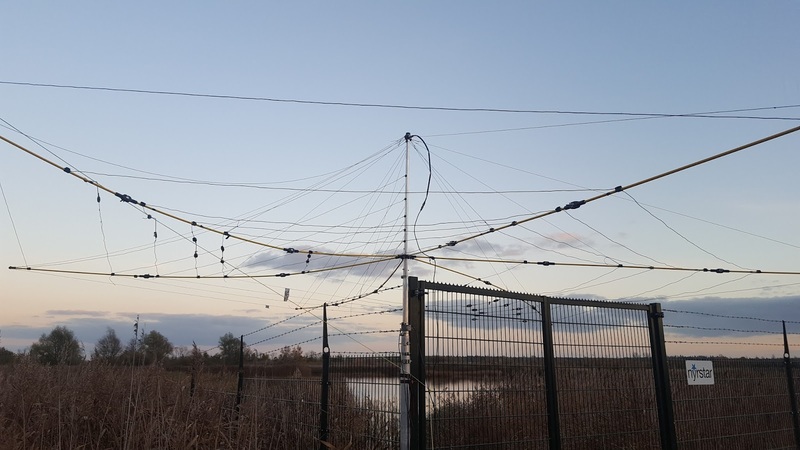 We know ground conductivity impacts the antenna radiation pattern, but it is quite another thing to say that you should forget about specific antennas because they perform better over salt water. The backdrop - what is my reference? My reference antenna and the one I have used most often, is the vertical end fed half wave dipole. It is very easy to set up (down to 40m - when you go lower other factors come into consideration) and its performance is quite good. Any antenna has to beat this setup to be worth my attention. I have also used inverted V's and sloping wires. These antennas are definitely better on shorter skip (high angle radiation) but do not increase DX performance. My portable hexbeam beats all of the other antennas but is considerably more work to set up, does not fit everywhere (exp. in a forest), and is only a solution down to 20m. My default mast is the 18m high Spiderbeam HD fiberglass pole. I have a higher one (26m) but I consider taking that one as extra effort. I also have a aluminum mast for my portable hexbeam but that is also quite some work to setup. Note that for the end fed vertical a much more compact 12m pole suffices down to 20m. 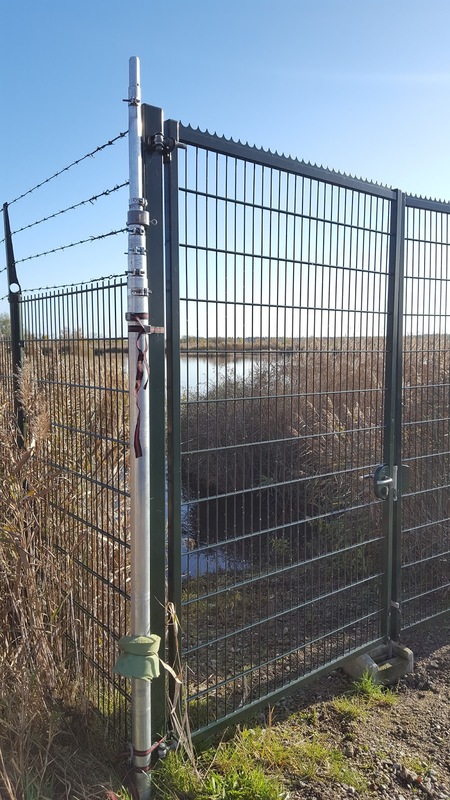 Looking at it from a portable operator, there are a couple of constraints you have to deal with that limit the antenna performance you can achieve. Winning a couple of dB on low angle radiation is quite a challenge without adding a lot extra complexity. Okay, so we are looking for a portable antenna with DX specs that are better than those of an end fed half wave set up vertically, without adding too much complexity. Would the VDA be an option? Before building anything, I usually model the antenna to see what it will theoretically do. Using 4nec2 the performance of the VDA varies a bit depending on the dimensions you choose for the elements and their distance. I modeled four versions I found documented on the web over ground conditions found in the area I live in (no salt water I'm afraid). The versions are by: PA3FYM (blue pattern below), OH1TV (red pattern), OZ1CX (green pattern) and F4BKV (pink pattern). You can see some design choices with OH1TV opting for higher gain and a lower F/B ratio. They all achieve maximum gain around 20 degrees radiation angle - a good angle for DX. Now how does this compare to my tried and trusted end fed vertical? The 20m end fed vertical can be set up using a 12m pole, but I would most often use my 18m pole. 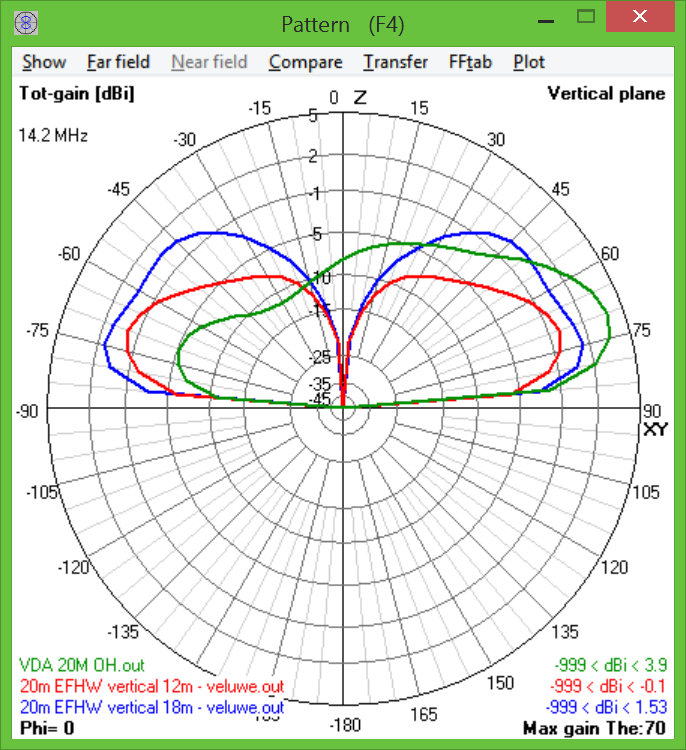 So I compared the OH1TV version of the VDA (highest gain) to an half wave end fed with its top at 12m and one at 18m. The angle of maximum gain is approximately the same - and all in the low range of 15-20 degrees (good for DX-ing). 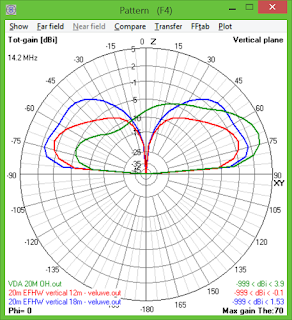 The VDA at approximately the same height as the end fed (12m high), gives a considerable gain of 4dB. All things equal this would mean you would need 2.5x the amount of power to get the same signal at the DX station. There is a bit more to say than just these maximum gain figures. With the VDA you lose the omni-directionality that is very convenient when you are not working someone in particular - e.g. when activating a nature reserve. But another factor (for me) is that I am testing this on 20m with the intention to make one for 40m later. In that case the reference end fed antenna is not as high (relatively) as I can get it on 20m, so the difference will be bigger in favour of the VDA. Last week I had a rare opportunity to go out again /P for a longer stretch of time. I decided to head to the south of the country to activate a nature reserve I had not visited yet: Weerter- en Budelerbergen & Ringselven. Because I had some time on my hands and I had not been on the radio for weeks, I went for the "full monty" - taking a hexbeam for the higher bands and a delta loop for 40m. I was not going to let the conditions ruin my day. 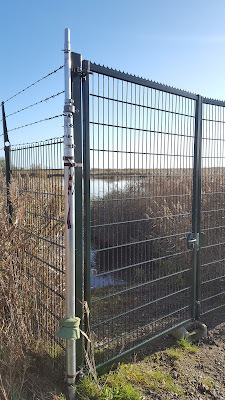 When I arrived at a lake in the nature reserve I was suprised to find a nice sturdy gate - placed by a local fishing organisation to corner off a piece of the lake. This made setting up the hexbeam a bit easier. There was some old metal pole a bit further away that was helpful for keeping my Spiderbeam 18m mast up. 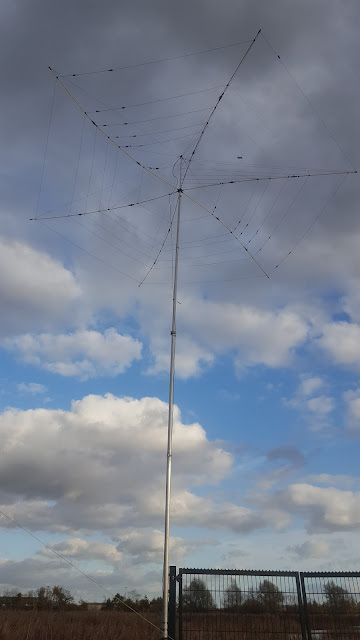 This mast was holding the full size delta loop for 40m. I had not used that in the field apart from some initial testing. When the antennas were up I first collected J5 on two bands (atno for me) and TO2 on a new band. Then it was time to wake up the WWFF chasers. I started on 40m as the higher bands were still rather quiet. QRM was manageable and the flow of chasers was quite constant - logging 116 calls in the first hour. Then it was time to try 20m with the hexbeam pointing east. The first contact was a nice surprise: a VU2 who commented on my signal level - being 9+10dB at his end. I worked VU only a couple of times before so I was thrilled that he came to say hello and even more so that signals were that good. He was followed by a number of EU chasers. As the earth kept turning North America woke up. K1RO was the first one to make it across. It was time to turn the hex that way. Signals were never very strong but QRM was low on 20m, allowing me to work 23 stations from 15 US states and 4 VE provinces. Not bad at all. In the meantime I was visited by a member of the local fishing club who wanted to know what I was doing. He made a minor point about me using their gate as a support but was satisfied after a short explanation of my intentions. After a while I did not get any response on my CQs anymore and dusk was setting in. So I decided to take down the hex while I could still see what I was doing and continue on 40m until I had to leave. Before doing that, I called TI2 and logged him on a new band (17m). Sadly 40m had turned into a very noisy band. It was hard to copy anyone at signal levels under s9. I did seem to put out a nice signal though as I saw a spot on the cluster from W3 and an OM from A7 (Qatar) came by to ask me what the heck my setup was, as I was that strong. The delta loop has made it into my favourite set of antennas. I logged another 60 chasers through the QRM. In just under 4h radio time I logged 254 calls from 44 DXCC, 15 US states and 4 VE provinces. ODX was TI2 at 9100km. Tnx to all the chasers that came by.